It's the day of the wedding, the groom is standing up front with the pastor awaiting the arrival of the bride. The first time the bride and groom lay their eyes on each other it should be just magical. The second they see each other they have tremendous amounts of love in their eyes. And that what you want to be captured. Some people would rather do them before the wedding in a more private area so that they are not rushed, but the more traditional people would prefer to do it the more traditional and old-fashioned way. So people may argue that it would be a better idea to stage the first look and do all the wedding pictures before the wedding so that it looks all nice and no one looks stressed or is sweating buckets, but the more traditional people believe that it should not be staged and that the pictures should be raw, emotional, and in the moment. The first look is the second the groom lays his eyes on his bride and should be something that he'll never forget and getting a videographer and wedding photographer is the perfect way to make sure that you never miss a single moment. Would you rather have the pictures natural and in the moment or staged and hours before your actual wedding? That is just something to think of when you are planning your wedding. Lots of people have different opinions on whether they want a traditional wedding or a nontraditional wedding. Nowadays not everything is gonna be traditional in a traditional wedding and that's fine, but things a white dress, a wedding party, waiting to have the first look the second you walk down the aisle, etc. Some people agree that doing the First Look before the wedding makes it easier to get pictures in and helps them resolve some nerves but others argue it's not as romantic as seeing each other at the moment. On your wedding day you are going to be very nervous, but the second you lay eyes on your significant other, you will know that all your stress and anxiety leading up to that very second of that day was more than worth it. The moment you lock eyes as you are walking down the aisle should be one of the most romantic moments of your wedding. Many brides would describe this as a "raw and intimate" moment between the two. While others would describe this as the moment they fell in love all over again with the man of their dreams. While those all for the First Look photo shoot saw it as a way to not only save time but to also calm down their wedding day jitters. It gave them a chance to make sure everything was in place and they get to see their significant other. It allows them to spend more of the day together and gives their photographer more time to take even more pictures of the reception. You are not feeling rushed or frantic. In a way, this does make a lot of sense, but it really just depends on the situation. If your getting married at sunset, this may be the only way to do it, but most brides would prefer to do the first look at the first time they lay eyes on each other. When you get married you are getting married to your best friend and your support system, so to some people seeing their other is something that calms them down and makes them more excited and comfortable to be getting married. Some photographers are actually against the First Look fad. They believe that the first look should be when the bride walks out those doors or around the corner and down the aisle towards her future. It should be that intense moment that they lock eyes for the first time, just minutes before they vow to spend the rest of their lives together. The moment they see each other and they look each other in the eyes is when the first look will mean the most. Yeah, they will be nervous as all get out, but you will get to see the anticipation, the relief, and the love all in one picture. That moment is not something you can stage, it is something that can only be seen and recognized in that very moment. 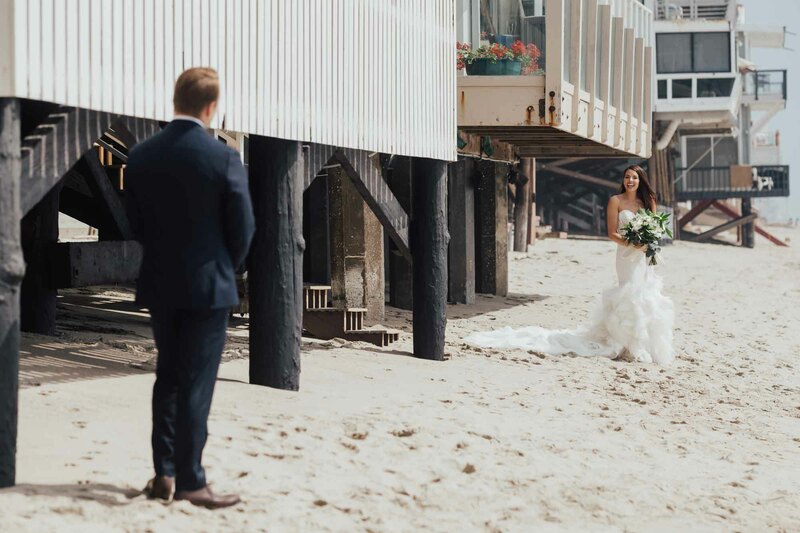 There are two different ways to do the first look: before the ceremony in a non-traditional way or after the ceremony before the reception, the traditional way. It just depends on your preference and if you want a traditional wedding or not. There's no right or wrong way to do your pictures, it's just how you want to do your wedding. Your first look is first and foremost one of the most romantic moments of your wedding. And how you choose to document that, is all up to you. ● Gets all the pre-wedding jitters away. ● You are not rushing after the ceremony to get all the pictures in before the reception starts. ● You don't look scared or nervous in the pictures. ● Allows you to spend more time with your significant other. ● If you are getting married at sunset, you may have no choice but to do your pictures beforehand so that you are able to capture that moment. ● It is not as romantic if it is staged. ● It does not show the rush of emotion you get when you see your significant other. ● It cannot capture the moment perfectly the way it would the traditional way. ● Although you will be in the right attire, you won't be wearing your wedding rings unless you do it after the ceremony and before the reception.